One of the most accurate and inaccurate criticisms leveled at the romance genre is that they are all the same. It’s accurate because—let’s face it—the reader goes into the story knowing how it is going to end. In fact, it is this guarantee of a happy ending that keeps many (if not most) romance readers returning to the genre again and again. However, the criticism is also inaccurate because, as in many things, it’s the journey, not the destination that counts. What the criticism has tapped into, however, is that romance novels are often a series of language tags and allusions that create what authors Jayne Ann Krentz and Linda Barlow describe as a “code clearly understood by readers but opaque to others.” In other words, what some readers see as formulaic, others recognize as signposts as to the type and style of novel they are about to enjoy. Somehow, Anne Gracie never missteps. Take, for example, her latest novel The Accidental Wedding. The plot synopsis reads like a dream list for mockery: amnesia? Check. Impoverished, yet feisty heroine? Check. Hero looking for “suitable” wife? Check. Adorable, precocious children? Check that one five times, one for each of our heroine’s poor half-siblings, under her care since being orphaned by the death of their shared father. It doesn’t seem to matter though. Anne Gracie’s writing dances that thin line between always familiar and always fresh. She is able to take a Cinderella story (which, at its most basic, is exactly what Accidental Wedding is) with all the inherent—and comfortable—tradition, mix in a few recognizable elements (the characters of the suitable-wife-seeking hero and strong-and-feisty heroine are well-known in romance), add a dash of the unexpected (beekeeping and a culpable father), and a sprinkling of the unpredictable (children in romance occupy an uneasy position between diabetes-inducingly cute and adults-in-smaller-bodies), and come up with a luscious indulgence of a novel. There are some slight off-notes—the resolution of the hero’s issues, for example, happens very quickly. This can be explained—but not away—by the fact that the hero himself never really bought into the issues, but rather attempted to splice them onto his character as the logical thing to feel (forgetting, of course, that feelings have very little to do with logic). A house party toward the denouement also parades the requisite happy couples from previous novels across the page, but it must be said that the context set-up for this meeting does make sense, even if it hits upon a personal pet-peeve. 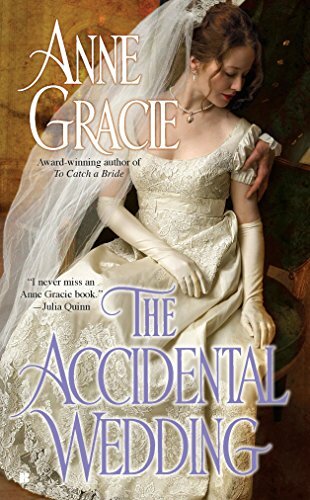 All quibbles aside, The Accidental Wedding is warm and sweet, tempered with bursts of piquancy and a dash or three of spice. Like chocolate and chilli, this novel is your favorite comfort food, with an unexpected—delicious—twist.